When Nurse Tommy Sing answers a patient's call he has to put his game face on, literally. 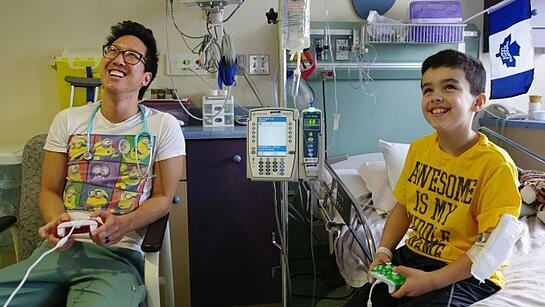 Sing spends his days pushing different buttons on medical machines as well as game controllers. He may want to keep his actual day job though. His patients seem to always beat him. Read more below to see how Nurse Sing puts smiles on his patient's faces. "No! No! Don't die! You died!" The shrieks come hurtling down the hallway of the Children's Unit at Grand River Hospital, but don't be alarmed. They are punctuated by laughter — a lot of laughter. Registered nurse Tommy Sing is playing a video game with 10-year-old patient Conner Quigley, and he's losing badly. "I've always liked to play," he says, "I was never good at them, obviously, but I've always enjoyed playing them." Sing, who has been working on the Children's Unit for almost six years, has been dubbed the unofficial video game guy for the amount of time he spends playing with patients. "I've played everything from Minecraft – not very well, but I've played Minecraft – all the way to games on the Nintendo Wii, all the way up to playing Call of Duty with some 16 and 17-year-old patients," he said. "You know, I'll walk into a patient's room and they'll already have the Xbox or the Nintendo Wii already set up and then we'll start talking video games. Obviously, sometimes, on the floor it's too busy for me to play with them, but if the opportunity presents itself or I finish my shift at 7:00 p.m. I'll stay after work and play a couple of rounds with them." Although video games often get a bad rap in the health sector, being blamed for everything from poor eating habits to behavioural problems, Sing says they help him build quick rapport with the kids on the unit. "It gives you one thing definitely that we have in common," he said. "It's so easy to just break the ice by playing the games and it just helps snowball into finding more and more about each other and even having more and more in common with each other." He says the relationships he's been able to form with the patients makes it easy to crawl out of bed in the morning and come to work, even when his shift starts at 7:00 a.m.